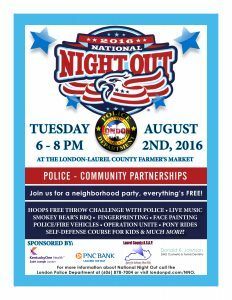 LONDON KY—Tuesday, August 2nd, 2016 marks the 33rd Anniversary for the Annual National Night Out (NNO) crime and drug prevention event that will be held locally for the first time by the London Police Department at the London Laurel County Farmer’s Market from 6 to 8 p.m. This night is designated for communities throughout America to stand together to promote awareness, safety and neighborhood unity. The community is invited to come out for a free, family friendly safe night out with food, games, giveaways, health screenings, and more. The Department is one of five participating police departments within Kentucky. This event showcases the vital importance of police-community partnerships and citizen involvement on our fight to build a safer nation. “We encourage everyone to come out and not only enjoy in the festivities but also get to know the officers that are dedicated to protecting and serving this community,” said Magen Zawko, Public Information Officer for the London Police Department. The event will kick off with the National Anthem, Kites the band playing live music, and a multitude of festivities, including free throw challenges with officers, face painting, giveaways, Cowboy Up for Christ offering free pony rides, free Smokey Bear’s Barbecue, United Way serving free hot dogs for kids, London Police sharing self-defense techniques for kids, free fingerprinting for children, Operation UNITE providing a fun activity, Finley’s Fun Center handing out balloons, and free health screenings. Emergency vehicles will also be present and a mobile drug take-back unit for the community to drop off and dispose of their unwanted/unused prescription pills. In addition, the Kentucky Blood Center’s mobile unit will be present from 4:30-8pm. Before NNO begins, the Bloodmobile will be accepting first responders from 4:30 to 6pm. All who donate will be entered into the Drive Kentucky drawing for the grand prize of a 4x4 Toyota Tacoma. The drawing ends on August, 31st. The first 25 to donate will receive a t-shirt from the London Police Department. As a participating NNO police department, London Police are required to choose a “Project 365” to focus on until next year’s NNO event. The Department has chosen to increase the number of Neighborhood Watch programs throughout the city to reduce crime rates and make London a friendlier and safer place to live. There are approximately five Neighborhood Watch programs who currently meet on a monthly basis. Sign-ups citizens to begin a Neighborhood Watch program in their area will be available at the registration table at the NNO event. “A community united as one speaks volumes, and leaves a lasting impact on future generations. Now is as good as a time as ever to show our unity and support for each other,” Zawko said. 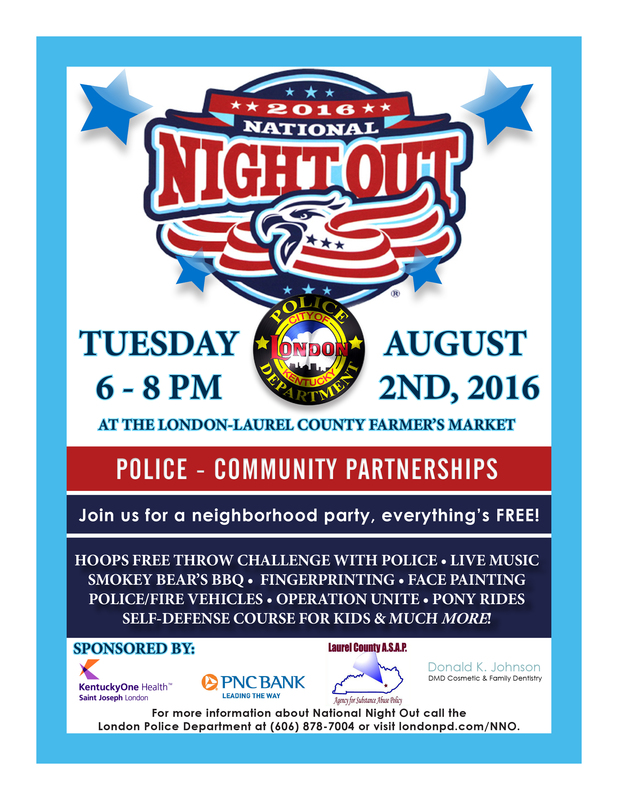 For more information about the London Police Department’s NNO on Aug. 2nd at 6-8pm at the London Laurel Co. Farmer’s Market at 529 S. Main Street, call Public Information Officer Magen Zawko at (606) 878-7004 or visit www.londonpd.com./nno.